Once again it’s been a long time since I have been active in maintaining my blog. I am restarting it again and I have also been posting videos on my YouTube page again. I’ll put the link at the bottom. Right now they have been supplement reviews but at least I’m getting active with it again. A lot has changed since my last post. I don’t remember if I mentioned that I was diagnosed with ulcerative colitis and have been receiving IV infusions for it. UC has changed my life and I am trying to adapt to the changes as best as I can but it is not easy. It starts with the food I eat. A lot of the food I used to eat I had to give up. I can’t eat lettuce so salads are out as are most fruits and vegetables. I gave up peanuts and peanut butter, almost all dairy, I try to avoid bread and gluten. It is not easy. Some things that don’t affect me today when I have it will hurt me the next time I try it. It’s really hard to predict how and what will set it off. I’ve been in an active “flare” for over a year. It has made doing the simplest things difficult and has caused a lot of embarrassing times and uncomfortable situations. It is hard for me to go to the gym because I keep having to run to the locker room and when I get back someone else is using the machine I vacated. This has caused me to buy my own gym equipment for my garage but I still go to the gym when I travel for work. (more on that part of my life in future posts). This blog is going to be more than a place for me to post about my working out, it’s going to be a place for me to open up about being healthy and dealing with my UC while pushing myself every day. I will still be posting reviews of supplements and other things and posts from my YouTube vlog as well as stories about me, my wife and my dog Chance. They are my rock and safe place throughout all of this. So stay tuned for more. So far so good on my plans to be more active on my blog. I enjoy being able to tell my story and share my experiance with anyone who wants to read it. I will also communicate with anyone who wants to talk, just leave me a comment and I will respond. This week I have decided to try P90X3. My wife has decided that she will do some of the workouts with me, sadly some nights we just don’t get to see each other because we are so busy and those nights are really hard for nus to get the time to fit the workout in. Event though the workout itself is only 30 minutes, it is more like an hour due to the preparation before and after, the shower and making sure that we have energy to do whatever else we have to do. At this point I am 2 workouts into the program and I am trying my best to be able to do it every day but some days are just not long enough. These workouts are intense! Most of the exercise uses body weight or elastic stretch bands and don’t seem like much until you start doing them. 30 minutes doesn’t seem like a lot of time but by the time 10-12 minutes has passed I am already covered in sweat. Some of the exercises are fun, some of them are challenging and others are just like huh? The only thing that gets annoying about the program is the instructor. He seems like he either knows what he is doing (which I hope) or that he is a good actor. He has an annoying sense of humor which gets old pretty fast. The upside is that he is energetic about doing the program and that helps me to be able to do the work. Rather learn from an energetic and annoying person than a bored quiet person. The other downside is that since this program is owned by BeachBody, there is a lot of advertisments before and after the workout. I get the fact that they want to advertise other products in this video but does it have to be before and after each workout? I will post pictures in a future update, they are on my cellphone. I feel this will definatly help me, the question is how much? My friends and I have started another 3 month cycle of our “Biggest Loser” challenge. I lost the first by .2% and was a little bummed but hopefully I can push myself more this time around. My big issue lately has been that even though I am still working out 3-5 days a week and not eating too badly (I slip here and there), I have stopped losing weight. I would love to say that I hit a plateau but that wouldn’t be true. I have actually started gaining weight. Since I started doing a “Biggest Loser” challenge with my wife and friend I have lost weight. From January first to April 1st I lost 3.2% from 180.5 to 175.4 and that was weigh in on a good day. At times during the challenge I was around 171-172 and feeling great. Now it is possible that I have gained muscle which adds weight since muscle weighs more than fat and I do see what looks like bigger arms, but nothing that would cause me to gain 5-6 pounds of it. I remain active and we are going to be continuing the challenge or starting it brand new and I am going to try to do some more things to try to maintain myself and hopefully cut some of the fat. During the challenge I was able to gauge my body fat percentage and currently it is around 14.4 where as at points during the challenge it was around 11-12. Hopefully I can get back to this, not sure which diet I should try since I feel like they all leave me hungry and I end up eating more food as a result. It seems like dieting actually makes me worse than when I eat whatever I want to eat. Strange I know. Stay tuned and I will post again shortly! So apparently today is 1 year since I have started this blog and I know it has been a long time since I have posted an entry. I also know that I have said that on my last post or 2 but hopefully the road blocks are now done and I can continue with this blog like I had originally planned. In the last year (and what a year it has been) my life has been all over the place. I changed positions at my job and with that came and entire lifestyle change. Gone were the long train rides followed by the subway to work everyday and in were long drives to work followed by longer hours. The upside is that I get to at least drive my car everyday instead of paying for a car a barely touch but the downside is I am still away from home a lot more than I would want to be. The location that I am at now moves at a slower pace than my last location which has lead to some unhealthy eating habits that I have had to keep in check. Longer hours with less busy work and moving around means more snacking and that hunger that comes from sitting. With effort I have been able to change things around several times and I am back to eating healthy and having healthy snacks. I have also been able an “office gym”. This means that I have a drawer which includes: rotating push up handles, 25 pound adjustable dumbbells, yoga ma and elastic stretch bands. This has helped me to stay healthy while at work and not miss a workout, especially during the busy time of year where I was working up 7 days a week and all my shifts were at least 12.5 hours long. It hasn’t been easy but this set up has been a big help. I am have been active with my YouTube page but would like to be doing more. Right now I have a few reviews and box openings but I would like to develop it into more of a vlog web show type thing instead of just another place where someone reviews products. I enjoy trying new stuff and talking about it but I would like to show more diversity in what I post. Another great addition to my life has been my puppy Chance. He is amazing, we got him last summer and he has changed my life for the best. He is a 50 pound hound/lab mix and loves to explore and has become a great hiking companion for my wife and I. We are even going as far as to planning our vacation around him. A road trip to Florida where everything we do and everywhere we stay is dog friendly. Lastly, I have finished my home gym. Where it won’t replace me going to an actual gym (because I can’t afford all the equipment nor do I have the room) it helps keep my wife and I in shape on days where we are home and can’t make it to the gym. For a home gym it sure is a great set up and I am very happy to have it. Stay tuned as I will hopefully be better at posting more. 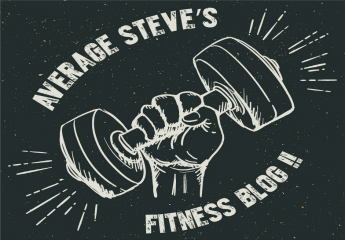 Check me out on YouTube, search for averagestevesfitnessvlog and on instagram.